Take a few moments to really look at this creation and the amazing attention to detail. It really is one of the most incredible cakes I’ve seen. Can you imagine having it as the centerpiece at your reception? This cake took Hockleys to the finals at the 2013 Baking Industry Awards for Celebration Cake of the Year – and for good reason. 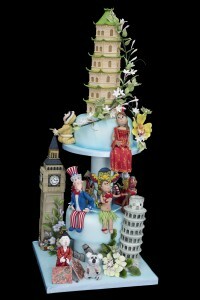 While the cake itself is only two tiers, everything on the cake – the figurines and all the buildings – are edible! The 30 inch tall cake features two tiers surround by a Geisha girl, a Canadian Mountie, a Rastafarian, a Viking, Uncle Sam, a hula girl, and even an adorable koala. The sugarpaste figurines are surrounded by iconic buildings including the Leaning Tower of Pisa, Big Ben, and a Chinese pagoda. In addition to the edible buildings and figures, the cake is also decorated with Chinese jasmine, hydrangea, and cymbidium orchids. This is truly an incredible cake and would be amazing for the world-traveler bride and groom. Thanks to our friends at Hockleys Cakes for sharing this cake with us!